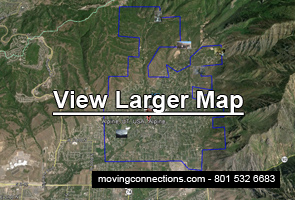 Moving Connections is your premier moving service for local moves in Alpine. We have been moving Utah families and corporate offices in Northern Utah for three decades. We at Moving Connections have a commitment to providing professional moving help at an affordable price. As local movers, we are sensitive to the budget concerns of Utahns involved in residential moves as well as those who are considering an office or business move. For those wishing to save some money, Moving Connections is a Moving Company offering a labor only move. With this service, our professional moving crew loads a truck that you have rented from a vehicle rental business. You can package and wrap your household goods yourself, but Moving Connections provides the muscle and professional loading service. Since we charge only for time and materials, this can save you some money. However, if you want to avoid the headaches and turmoil of wrapping and packaging items yourself, you can select Moving Connections’ most popular option, the full service move. This service allows you to tend to other matters while our experienced moving personnel professionally wrap and pack your household goods. So whether you’re planning a corporate relocation or a household move to a new location, Moving Connections stands ready to assist you every step of the way. Our moving crews at Moving Connections are trained to move families, not just furniture and pianos. With more than three decades of shipping and moving experience in Northern Utah, Moving Connections knows how to serve the moving needs of Utah families and individuals. That’s why we’re a top tier professional moving company in Utah. We’re a local moving company, and small enough to be personable, but big enough to provide top notch moving service for all your needs, including moving pianos, both upright and grand, pool tables, gun safes, paintings, exercise equipment, and a host of other large and heavy items. And although we at Moving Connections serve other Western states, we specialize in providing local residential and commercial moving services to residents of Utah. And since we’re federally licensed, bonded, and insured, and we provide first class moving service, we feel justified in saying that Moving Connections has raised the bar of service in the moving industry. If Moving Connections is moving you to Alpine it's a perfect time to begin to utilize the many resources and bounties of Alpine. For example click on the picture to the left to go the Moving Connections 'Support - Advice - Assistance' page and discover Alpine for the first time. Once you are on the 'Support - Advice - Assistance' page go ahead and open the .pdf link found there and tape the list of emergency and useful phone numbers on your refrigerator. Moving Connections has gone to great pains to find those links and connections to integrate you quickly into Alpine life. If you’re looking for an Alpine moving company that provides a “labor only” service, then look no further: Moving Connections has exactly the service that you need. With this service, you save money by renting a truck and driving your goods to your new destination. And you can save even more money by wrapping and packaging the smaller household items yourself. Moving Connections will stretch wrap and blanket wrap the furniture and other larger items according to the highest moving industry standards, and we will load all items. This can save you money by substantially reducing labor charges, because the more you package, the more you save. If you’re not an expert at packing items for moves, you can do a search on the internet for videos on how to pack items for a move. These can help you to avoid breakage and wasted time. And if you need professional grade packing materials or packaging supplies. Moving Connections has more than one hundred various types and sizes of boxes, plus tape, packaging paper, bubble wrap, and hundreds of other items. Whether your corporate move is just an office move to another floor in the same building, or whether it’s an entire corporate relocation to another city, Moving Connections will provide you with the best moving experience for your corporate transition. We might even be able to coordinate with you so that you can stay up and running during the move, depending on the type of business you have. Our professional corporate moving crews will have you set up at your new location as quickly as possible. And keep in mind that all of our crew members are experienced movers, so you’re getting a top notch moving crew that knows what to do and how to do it when you hire Moving Connections. Of course, we will stretch wrap and blanket wrap your office goods with as much care as we would if we were moving your valued household items. But be certain to let us know about any particularly bulky or heavy items well in advance so that we can make preparations for them. And here at Moving Connections, the rate for office moves/corporate moves is the same as it is for household moves. You just pay the hourly rate plus the cost of packaging materials: no taxes, no fuel surcharges, no junk fees, or any other extraneous charges.